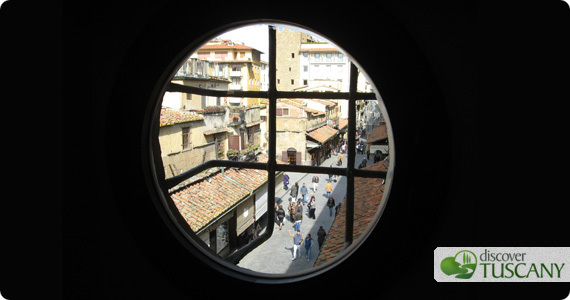 Last year, local officials had announced the Vasari Corridor was closing for restoration, then in April we had the good news that it would continue to be open for a few more months. Tickets were very quickly sold out. Due to the popular demand, the Corridor was once again open from September until December 2010. Several people have posted on our forum asking whether tickets were still available or whether the period was going to be extended. Restoration has yet to start, so once again we have some good news! The superintending body over the corridor has announced that it will be re-open from February 2 to April 15th, with 6 visits per week. You have to call Firenze Musei to book your visit at +39-055-294-883 (don’t worry, they do speak English). The guided visit is in Italian but the guides when possible try to accommodation foreign language speakers. There will be two visits on Wednesdays and Fridays at 2 p.m. and 4:30 p.m. and two on Thursdays at 9 a.m. and 11:30 a.m. Tickets include entrance into the Uffizi Gallery and cost € 10,50 until March 7th, then the costs will rise to € 14 after from March 8 since an exhibition called “Figures, memories, space. Drawings from Fra Angelico to Leonardo” will open in the Uffizi Gallery. Remember to call and reserve your visit today!